The only time I ever tasted Pasta was from a friend’s plate when we ordered it in a Continental[Duh..where else] restaurant.I dared not order a whole plate for myself since I wasn’t so sure I would like it after I threw away the whole lot of the famous S pasta treat when I made it at home.I instantly disliked it[the readymade one].My friends told me I tried out the wrong one and I should try having pasta at an Italian restaurant and I will love it etc etc. I’ll be honest-anything dunked in cheesy,creamy white sauce would taste good,really.All you pasta lovers out there-Don’t start throwing your pasta at me..;). I wanted to make it at home after seeing a very simple recipe in my Microwave cookbook.After all,how difficult can it be..and as they say,anything home-made ought to taste better.So I donned my apron and went about making Pasta yesterday. It is a super simple recipe.I added extra veggies just in case the pasta doesn’t come out good,at least we could munch on the veggies..lol.Well,guess what,we liked the Macaroni Alfredo-not my creation,that’s the dish name.Not actually loooved it,but yes,it tasted good.The best part is,it can be made in the Microwave.No checking for lumps in the white sauce-there wouldn’t be any,if you follow the exact procedure.Now let me not waste anymore time of yours.Here’s the recipe. Put 1 ½ cups of water & 1 tsp oil in a deep microproof bowl.Microwave uncovered for 3 minutes. Add macaroni.Mix & Microwave uncovered for 5 minutes. Let it stand in hot water for 5 more minutes,drain and wash well with cold water. In another microproof flat dish,microwave butter for 30 seconds. Add oregano,onion and vegetables.Microwave uncovered for 5 minutes. Add flour,microwave for 30 seconds. 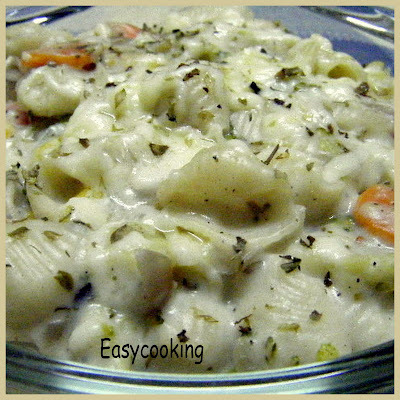 Add cooked macaroni,cream[I added ¼ cup milk] and half of grated cheese.Mix well. Sprinkle the other half on top and microwave for 2 minutes. [I grilled the same for 5 minutes for that crispy layer on top]. LOL! Divya, thanks for inspiring me to use my IFB NM's cookbook! I have never attempted cooking anything in a MV... but now yes! I am literally drooling!! Such a wonderful recipe divya! Pasta in a microwave well that's something.. i may never end up trying it but it seems rather fast and no fuss method. The final outcome look nice and creamy. I love pasta with alfredo sauce. Looks too good Div. We love our pasta, so it features a lot at home. In fact pasta is lunch today! This is one of my daughter's favourites. OMG looks soooo creamy and saucy! yum yum! I've never cooked anything in the microwave as yet, but tis sure inspires me. Especially the no lumps part...pasta looks creamy n delicious. wow... that looks very nice. I've never made white sauce in the microwave before... should try! if i do not have a microwave how long should i cook after adding the flour,how will it look b4 i move 2 the nxt step? Could you let me know whether the microwaving has to be done at high?? just cooked macroni alfredo for the first tym..and it was so yumm that i coudnt believe my hands..everyone luved it..it was so mouth watering and tasty that i'll cook it 2morrow also..